Here's a look at one of my favorite collectibles and part of my autograph collection at the same time-My Autographed Batman Forever Nicole Kidman Poster. 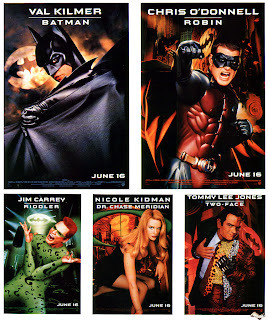 When the posters in this set came out to promote the latest Batman movie I had easily picked up the other four posters in the series, but was not able to find the Chase Meridian piece of the puzzle. Shortly after I bought the other four in the set I happened to catch QVC doing a Batman Forever special segment. Wouldn't you know it? They were offering all five from the set. Not only framed, but autographed by each of the actors whose characters were portrayed in the posters. I couldn't resist getting the one I needed to complete the set. I would have loved to get all of them, but at $300 a piece back in 1995 it was a little bit out of my budget back then. For more Batman movie posters check us out.